I don’t remember the details of every Superbowl party that I have ever attended. Some of the half-time performances or spectacular plays stand out in my memory, but let’s be real: I go for the food! From the dips to the desserts, I always enjoy the wide variety of food a Superbowl spread brings. For this week’s challenge of remixing a vintage recipe, I decided to tackle the famous chicken tender. But usually not too healthy. My redo of this old classic gives it a healthier spin, while still keeping the flavor strong! I am a Nashvillian now, so what better flavor to go with than Nashville Hot Chicken?! This spicy update is baked—and even gluten free! 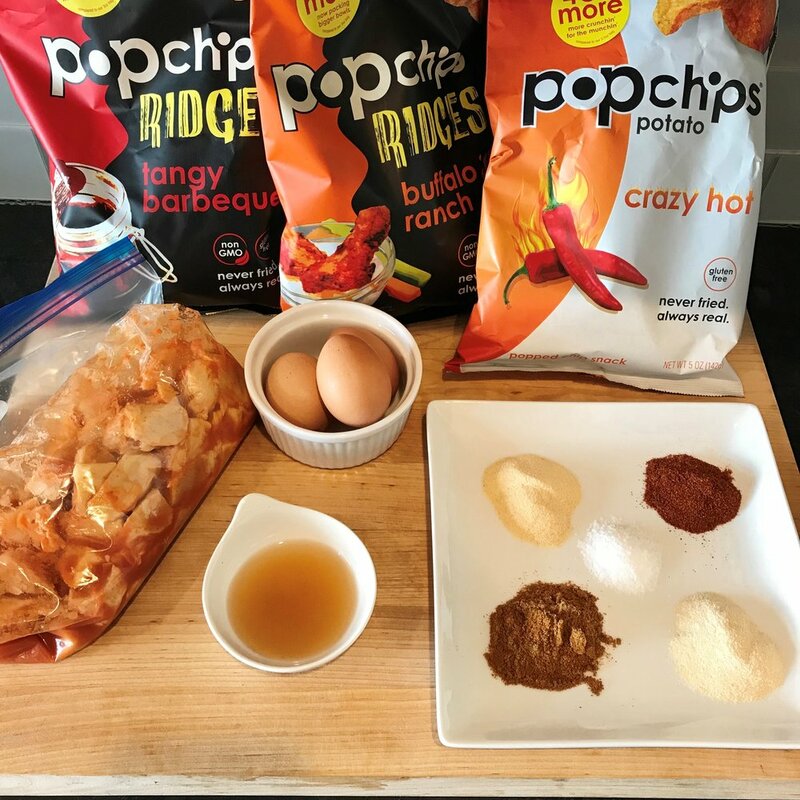 I've also made this recipe to fit Paleo standards by substituting the Pop Chips for pork rinds. For larger parties, I like to cut my chicken into cubes instead of tenders because it allows for bite-size snacking! Also, the easiest way to get the Pop Chips to the perfect breading size is by tossing them into your food processor. Believe it or not, I just got my first food processor this Christmas from my sweet husband. So if you have no food processor, no worries—I've got you covered! Just make a small cut in the top of the chip bag to release the air, then crunch away on the bag with your hands or a rolling pin. Other than the food and football, my favorite thing about the Superbowl is having an excuse to get together with friends. I hope this Superbowl Sunday finds you hovered over a table full of food enjoying football with friends. Pour the Franks Red Hot Sauce into a gallon-size food storage bag, then add the chicken tenders. Seal the bag and place it in refrigerator overnight—up to 24 hours (the longer you let the chicken marinate, the more hot sauce flavor it will absorb). After marinating the chicken, preheat the oven to 400°F. In a bowl, whisk together the eggs, apple cider vinegar, garlic powder, onion powder, paprika, cayenne, and salt, then set this mixture aside. Crumble the pork rinds inside their bags until their texture resembles panko breadcrumbs. Then, one at a time, remove the chicken tenders from the marinade bag and dip them in vinegar/spice mixture, coating completely, and then holding them up to allow the excess liquid drip off. Place each tender into the Pop Chip or pork rind bag and shake the bag until the chicken is coated in crust. Lay the tenders on a parchment-lined baking sheet, keeping two finger-widths between each tender. Bake until fully cooked—15 to 20 minutes. For the best flavor, you will need to marinate the chicken in the Franks Red Hot overnight, so plan ahead!